Junkies and drug addicts usually steal and sell goods to buy hard drugs, but for one Japanese otaku, his theft was fueled by a different sort of addiction. However, when he shoplifted a toy robot from the wrong guys, he became one of peaceful Japan’s most wanted criminals. 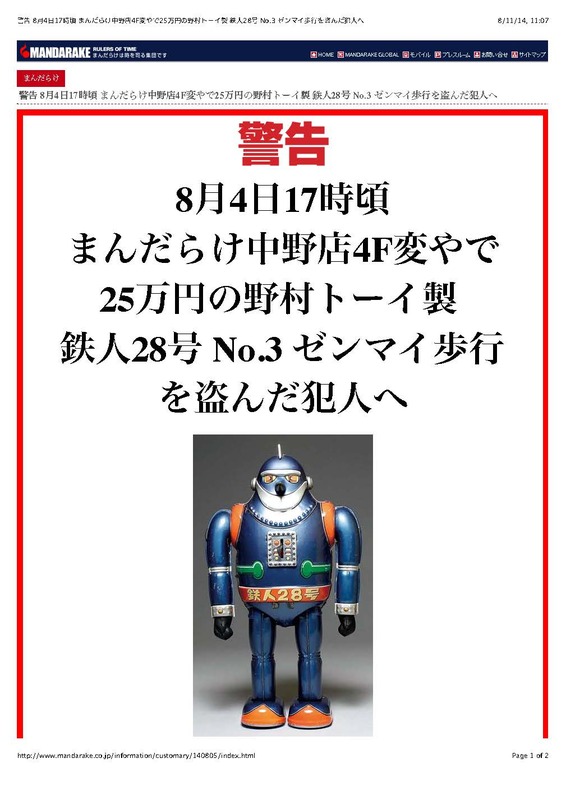 Last week, on August 19, police arrested 50-year-old Kazutoshi Iwama for shoplifting a “priceless” wind-up tin robot, Tetsujin 28 (鉄人２８号） from a toy and manga goods store—-after a two-week manhunt that became the talk of the Internet and headline news in Japan. For those not familiar with Japanese manga, Tetsujin (literally “Iron Man”) is a giant robot who first appeared in a manga written and illustrated by Mitsuteru Yokoyama, which was popular in the 50s. In the original story, the robot was developed in the final days of WWII by Japan’s Imperial army as a secret weapon to help the empire win the war. After the war, numerous heroes and villains fought for possession of the remote control that would allow anyone to use the giant robot, for good or evil. Finally, he comes under the control of a young private detective, who uses Tetsujin 28 to stop crime and fight other robots. Sometimes, Tetsujin 28 and his boy master even worked with the Tokyo Metropolitan Police. WANTED: If you’re the guy who stole the wind-up Tetsujin 28 (robot toy)– Give it back or else! This photo of the slightly chubby robot toy thief was posted by the Mandarake store. They threatened to expose his face to the world if he didn’t return the wind-up robot by August 12th. He couldn’t; he’d already sold it for 65,000 yen to buy more monster figurines. When Mr. Iwama was caught, he initially denied involvement in the crime, but when confronted with hard evidence, he eventually fessed up saying, “I shoplifted in order to get money to buy monster action figures,” according to the Asahi Shimbun. “I love the sort of monster figures and dolls that appear on Ultraman, and I wanted to buy more with the money I made from the action figure [I stole],” explained Iwama, who has been working a series of part-time jobs. According to the police, Iwama says that he noticed the glass case holding the robot was unlocked and stole it on impulse. He then sold the robot to another manga goods store for 64,000 yen ($640) several days later. The police tracked him down from that sale. When they searched Iwama’s home in Chiba, Japan, they found a large collection containing dozens of monster action figures. Police are now investigating to see whether other stolen nerd contraband is in the collection. On the other hand, Mandarake’s stunt raised questions of whether or not they were committing a crime themselves amongst the legal community and has created a lively on-line debate. “Under the provisions of the Penal Code, it’s criminal intimidation if you threaten someone, even if it’s to take back a legitimate loan,” said Hisashi Sonoda, a criminal law professor from Konan University Law School, according to the Sankei Shimbun. Masuzo Furukawa, the president of the company that owns the “Mandarake” chain stores, told Japan Subculture Research Center prior to the arrest via email, “Our basic principle is ‘condemn the offense, but not the offender,’ but if he doesn’t return the stolen item we will release his photograph and take actions to identify the criminal.” Mr. Furukawa stated to the press after the arrest that shoplifters should beware, and that in the future the store may take similar measures. However, due to pressure from the police, Mandarake later decided to not release the man’s photo. The Tokyo Nakano Police Department allegedly said that the store’s threat and the media attention surrounding it had “hindered the investigation” and they asked the shop to leave matters in the hands of the police. While the store was unable to carry out their own comic-book justice by unmasking the criminal, the media attention surrounding the story serves as a warning to toy robot-stealing bandits everywhere: stealing from otaku is a bad idea. 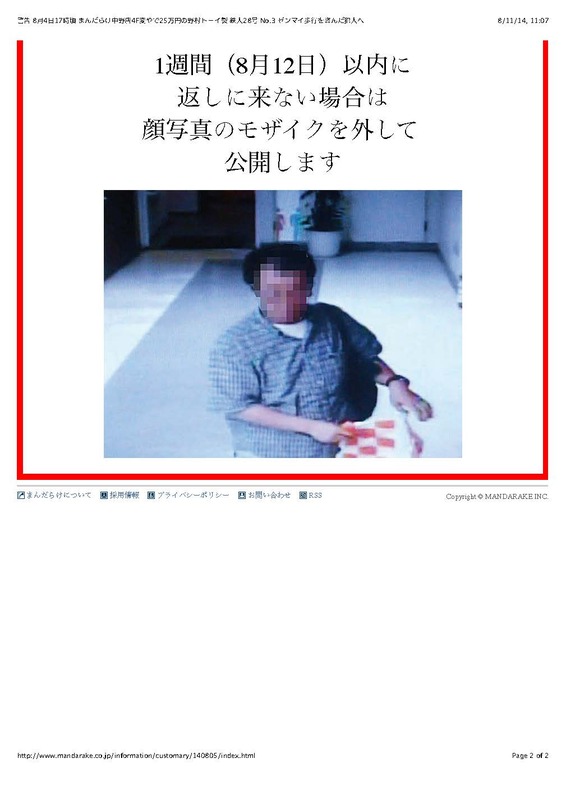 Not only may you be publicly shamed, you might also get arrested—even after Mandarake decided not to release Mr. Iwama’s photo, Japan’s television media had no problem broadcasting the unpixelated photo after his arrest. If anything, he should at least be grateful that the owners of the store didn’t have a life-sized Tetsujin 28 robot hunt him down… because the days when a smart otaku can make their own killer robots may not be that far away. And finally, it should be noted, that despite the Japanese police’s concern for privacy and their admonishment to Mandarake to not release the photo of the culprit—when he was caught, the information was quickly leaked to the Japanese press—many of whom photographed Mr. Iwama and then posted his photo all over the internet. And justice for all? A little fan trivia for you: Tetsujin 28 was also made into an anime TV series in 1963, the first giant robot anime to come out of Japan. It was edited and translated into English for broadcast in the U.S. under the name of Gigantor. A giant, 18 meter, statue of Tetsujin 28 stands outside Shin-Nagata station in Kobe. Thank you! I had no idea.